Portrayer: Eric Conger, June 21, 1978 - May 17, 1979; March 14, 1980 - August 11, 1980; September 24, 1982 - October 25, 1982. Arrival: (1978) Followed Blaine Ewing Cory to resume their affair. (1980) Joined Jordan Scott's mob after being paroled from jail. (1982) Tailed Blaine Ewing Cory to seek revenge. Departure: (1979) Extradited to Nevada and jailed for car theft. 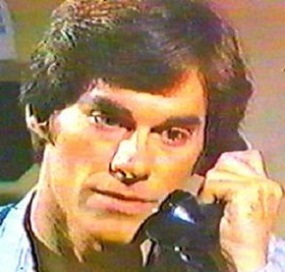 (Reintro, 1980) Over the phone to Blaine Ewing requesting they meet at a coffee shop. (Reintro, 1982) Appearing in Blaine Ewing's drugged state, "You remember me, don't ya?" Exit Scenes: (1979) Being restrained by Larry Ewing until he was arrested. (1980) In Blaine Ewing's apartment in response to Jordan Scott's threats, "Yeah. I understand." (1982) To Sandy Cory hanging from a cliff, "Well, just look at the pretty boy, now, huh?" Then, lying dead at the bottom of a ravine. Birthday: Born in the late 1950's. Date of Death: October 25, 1982. Cause of Death: Falling off a cliff during a fight with Sandy Cory. Other Aliases: Robert Winslow (real name). Relatives: Alma Rudder (RIP), sister. Medical History: Presumed dead in 1980 from an apparent car accident. Legal History: Mugged Iris Wheeler. Jailed from 1979-1980 for car theft.